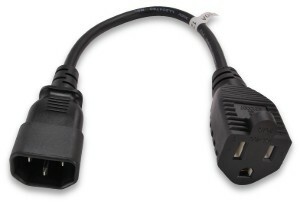 These power adapter cords allow you to utilize the power outlets found on the back of many PC's and other equipment. They have an IEC Male connector on one end (plugs into power outlet on back of some PC's) and a standard 3-Prong AC Female socket/outlet on the other, allowing you to plug in any standard equipment such as your printer, monitor, or even a desk lamp. These are sometimes referred to as "Outlet Savers" (see also Power Extension Cords) since they can reduce the number of power strip outlets that are needed by your PC. These adapters are available in 1 foot and 6 foot lengths, are black in color, and are constructed from 18AWG wire.